Ashley Liew is an athlete with humble beginnings. Many assume that fast runners they see today were speedy, slim, or gifted early in the game. This was not the case for him. Ashley did not participate in school sports teams up until Junior College at 16-years-old. Over the years he had become overweight and thus lacked self-esteem, so he turned to recreational running in a desperate attempt to lose weight. In 2004, he struggled to finish his first marathon in 4h29m34s. In the next four consecutive annual marathons, he would improve his personal best by about 5 to 10 minutes each time. In 2006, Ashley weighed as much as 80kg. This realization provided a wake-up call for him to take running even more seriously. He also took up triathlons as a different approach to getting fit. He was still a “nobody” in the Singapore endurance scene, just content in his continued bid to be healthy. His perspectives completely changed at the 2009 Singapore Marathon. In less than a year of working with running coach Mr Rameshon Murugiah (reigning Singaporean marathon record holder), his marathon time dropped from 3h34m14s to 2h51m22s, finishing on the podium as Singaporean runner-up. It was only then that Ashley realized there was more athletic potential to be tapped. Instead of running to lose weight, running became as an opportunity to make the most out of what he had been blessed with. His mom sadly passed in 2010 after her long fight against colon cancer, after which Ashley began running in her memory. Fast forward years later, Ashley’s current marathon personal best is 2h32m12s (fastest Singaporean for 2015), nearly 2 full hours faster than his first. In 2012, he was crowned Singapore marathon local champion. He also has an Ironman triathlon personal best of 10h3m29s. 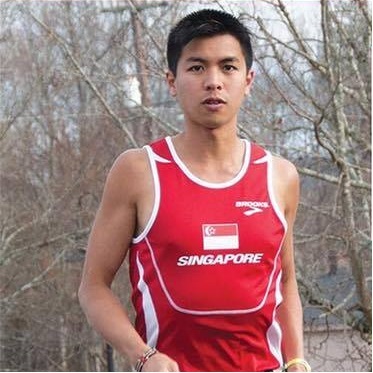 He was given the honour of representing Team Singapore in local and overseas races, including the 2013 and 2015 Southeast Asian Games marathon events. He has lost an inspiring 24kg of weight since 2006 as well. Today, Ashley continues to train on a twice-daily basis consistently, despite his responsibilities as an intern and student at Sherman College of Chiropractic in South Carolina, USA. Upon graduation in September 2016, he plans to return back to serve the community in Singapore as a Doctor of Chiropractic, an assistant athletics coach, as well as a national marathoner. His long-term goal is to qualify for the 2020 Olympics marathon. Ashley hopes his story will inspire the “everyday man” who likewise has hopes and dreams for the future. He was often teased and doubted in his early journey. However, he did not let that derail him. With faith, patience, teamwork, and commitment, things are possible. He believes it is possible to transcend the perceived pain, mental limits, background (or lack thereof), and the daily challenges of life. He is sponsored by Asics, as well as supported by Flexifitness and Family Health Chiropractic Clinic. In 2016, Ashley is humbled to be an ambassador of The Performance Series (TPS). He hopes to inspire the community to bigger possibilities via this new race series.